Ghost bikes are a phenomenon catching on in a lot of bigger cities, not to be confused with “ghost riding,” which refers to the ridiculous act of dismounting a bicycle in mid-ride and letting the bike roll on by itself until its inevitable crash, an immature display mostly associated with pre-adolescent boys showing off (been there) and intoxicated adults seeking a cheap thrill (done that). 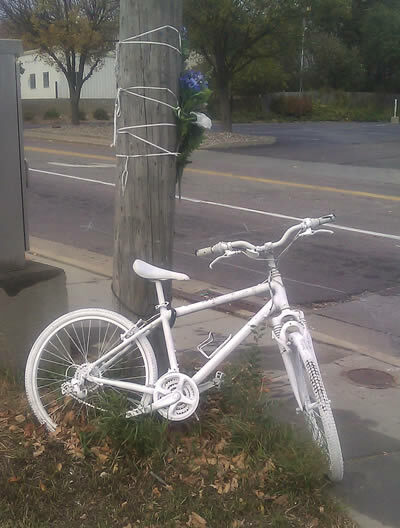 Ghost bikes are random bicycles that someone has painted – tires, seat, frame, and handlebars – completely white and then purposely placed at key points in the city, wherever some unfortunate cyclist has been struck by a car and killed. I have spotted a few white bikes in other cities and it’s an eerie sight. Part of the mystery of ghost biking is that the bicycle donors remain completely anonymous. Their only goal is to draw attention to the dangers of riding in traffic. Not all folks are keen on the practice. Ghost bikes can be distracting and some think they’re a downer. Others just believe the bikes unnecessarily impede sidewalk traffic flow and maintenance. A few times over the years I’ve come pretty close to having a ghostie placed in my honor. It’s a numbers thing; if you ride in traffic enough eventually you may kiss a bumper or two. I’ve been hit three times, once was pretty serious and resulted in shoulder surgery. There’s also an annual ride in many metropolises called the “Ride of Silence.” For this event a horde of cyclists from all walks (or “rides” if you prefer) of life amass in a semi-organized fashion to again commemorate cycling traffic victims and draw attention to the cause. As the name would suggest, all riders remain silent throughout the entire, mostly urban route. I witnessed one such ride in Sioux Falls a few years ago without knowing what I’d stumbled onto. In my infinite ignorance I questioned a group of quiet riders at a stoplight. My curiosity was piqued as it’s not too often you see an enormous line of bikes with no beginning or end in sight, snaking through the heart of the city. “Cool, thanks!” I replied, cutting our conversation off abruptly, but still a couple of sentences too late, stepping back to watch as hundreds of bicyclists toured Phillips Avenue without uttering a sound. This isn’t an “us vs. them” issue; no one wants to see a rider get launched over a car hood. As both a driver and a cyclist I can speak from either perspective. There are many individuals that give motorists a bad name, but there is an equally proportionate element of ignorant riders. No one follows the rules perfectly all of the time, but we all should make an effort to do so when it makes sense. Why not start with using turn signals correctly? Drivers, please keep this in mind, especially in springtime: The far right lanes are jacked with wet sand, snow and ice. If riders are “hogging” the road a little, it’s because it can be uncomfortable (unless you like the taste of sand) if not dangerous to ride on the outside. Give a bike some breathing room when you pass. If the opposite lane is clear of oncoming traffic, it’s perfectly legal and appropriate to cross the center line briefly as you pass another vehicle (a bicycle is considered a vehicle). Riders shouldn’t assume they are always being seen. Use lights and reflectors day and night and remain vigilant in traffic, as if your life depends on it. Ghost bikes and silent rides are both good, reactive ideas to call attention to those who’ve been struck down. But better yet, let’s collectively commit to proactive bicycle safety in Austin and eliminate their need all together. Traffic Tip: Check tire pressure frequently as the temperature fluctuates. Hear the Bike Rides Radio Show Fridays at 1:00 pm on KMSK, 91.3 FM, or play it anytime from dansbikerides.com.